Booking Mama: Review; Where's My Mummy? Summary: Little Baby Mummy wants just one more game of hide-and-shriek with Big Mama Mummy before bedtime. The night is deep and dark, full of friendly creatures that click their clacky teeth and whoosh past on flippy-floppy wings. But who will comfort Little Baby Mummy if a small, scritchy-scratchy someone gives him a scare? Big Mama Mummy, of course! Fresh, comical illustrations complement this ever-so-slightly suspenseful story with a satisfying ending. My kids just love Halloween so it's natural that they enjoy Halloween themed books too. The latest one that Booking Son is enjoying is WHERE'S MY MUMMY? written by Carolyn Crimi and illustrated by John Manders. I have to admit that I really like reading this one to him too! WHERE'S MY MUMMY? is a very cute story about a little baby mummy who isn't quite ready for bed so he suggests a little game of Hide-and-Shriek. (I don't know if any other moms can relate to this type of procrastination, but I know it all too well.) Baby Mummy counts while Big Mama Mummy hides, and evidently his Mummy is a very good hider. Baby Mummy sets out in search of her and encounters many scary sounds along the way. During their game, he runs into lots of creepy Halloween type characters who are getting ready for bed, but Baby Mummy never seems to get scared until the end of the book! Booking Son really enjoyed this book, and I think it's because every page was filled with a surprise. First, there are strange sounds; and then when you turn the page, Baby Mummy encounters various scary (yet really funny) characters. The book is suspenseful while also being very funny! I think preschoolers are going to love having this book read to them over and over again! I thought the book was just precious, but I must admit that I'm very partial to the illustrations. The Baby Mummy is the cutest darn thing -- I just love his eyes and mouth; and every time I see him I find myself smiling. I also like the drawings of the other Halloween characters, especially the Mama Mummy and Drac. This book is really too cute! 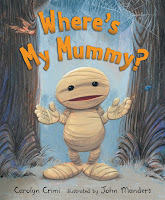 I definitely recommend WHERE'S MY MUMMY? It's absolutely perfect for this time of year, and I have a feeling that I'm going to be reading it a lot over the next few weeks. My son and I both like it so much that we're going to share this story with his classmates. I can't wait to see their reaction! This sounds like the perfect book for this time of year! This sounds super cute, I'll have to get it for Daniel next year. This book looks darling!! I love Halloween books! Check out Bone Soup. My daughter got that one at the school's book fair. It's a take off of Stone Soup but the illustrations are so cute. You can tell how cute the mummy is from the cover!!! I'm always looking for cute Halloween books that aren't too scary ... this sounds perfect!